We are a leading manufacturer and exporter of premium quality instant tea and coffee premixes all over the world. All our premixes are HACCP and ISO certified that ensure the quality of our products. 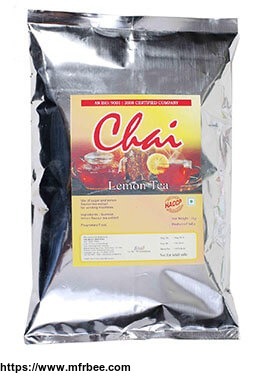 We have unique and exclusive flavors of instant tea, coffee premixes and sachets like elaichi tea, ginger tea, lemon grass tea, masala tea, hot chocolate coffee, cold coffee, black coffee & more. Chaikapi also supplies automatic fresh milk, tea & coffee vending machines.